Take a bowl. Add all the ingredients except bananas and ice-cubes. Mix it well. Take 3 glasses. Add ice-cubes. 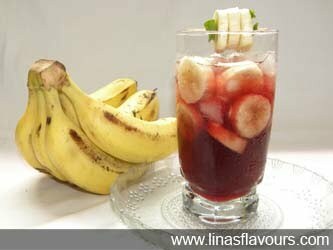 Pour mixed juice and top it with banana slices. Garnish it with banana slices and mint leaves and serve it immediately.